We invite you to the opening reception of The Living Jewel: Pearls to share as we celebrate the pearl in today's jewelry. Perhaps it was Mikimoto that said it best, "a pearl is a living jewel" and we couldn't agree more. For thousands of years the pearl has held a place in history; from legends of Cleopatra and Rome, to the Gilded Age residents of our very own "summer cottage" mansions here in Newport. According to legend written by Pliny the Elder of the Roman Empire, Cleopatra won a wager with Marc Anthony that she would be able to consume the wealth of an entire country in just one dinner by crushing a pearl into wine and drinking it. Such was the value of pearls that an entire countries' wealth could be deemed comparable. Inside the "summer cottages" of families such as the Vanderbilts on Bellevue Avenue in Newport, you can see portraits of the ladies of the house; painted with lavish strands of pearls gracing their necks. In today's society pearls are still dominant and beautiful additions to any jewelry collection. 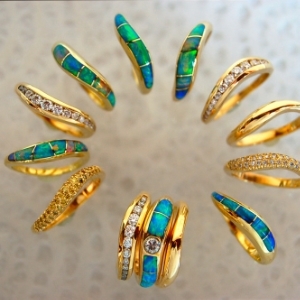 They can be seen as classic statements, or more modern & glamorous. The process of culturing has turned the once extremely elusive natural/wild pearl into something far more accessible, with the birth of cultured saltwater & freshwater pearls. We will have a selection of both natural and cultured pearls for you to peruse. All of our gallery artists will be showing new work featuring many varieties and colors of pearls. Or speak with one of our artists to design your own strand of pearls or earrings from our collection of loose pearls and strands. Owner & Artist Kevin Duris will be showcasing new work and classic favorites featuring pearls, including this Compass Rose Pendant with a gorgeous Mabe pearl. Mabe, or blister pearls are pearls that have been gown flush against the inside of the oyster shell, so they form as half-pearls. 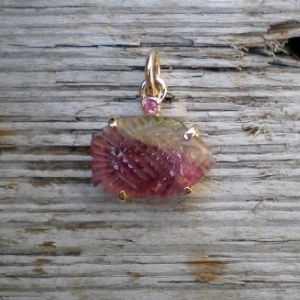 This shape of pearl is great in many designs where a cabochon style setting is used. Pick from our selection of loose pearls, and work with Kevin to create your one-of-a-kind piece. Laura Blanc exposes the diversity and beauty of freshwater pearls by mixing white and colored pearls, colored silk, and shell clasps to create the classic strand of pearls - with a modern twist. You will find combinations such as large white pearls with coral silk knotted in between, double strands of peacock pearls with violet silk, or any combination you can dream of! Laura enjoys working with clients to create custom strands of pearls. Lisa Mele incorporates gorgeous South Sea pearls into intricate 18k gold pendants decked out in diamonds and gemstones to accentuate each pearl. 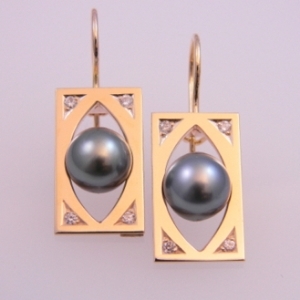 South Sea & Tahitian pearls are known for their exceptional beauty, quality, and size. They are frequently regarded as the rarest and most prized pearls to be found in jewelry. Maxine Rosenthal incorporates some of her signature sterling forms into beautiful clasps, creating necklaces where you want the clasp to be seen! These versatile pieces allow you to wear the clasp in the front or back, and many are long enough to double, increasing their versatility. Petri Kymlander incorporates Tahitian pearls into gold earrings for stunning statement pieces, crisply designed with diamonds in his signature style. Pictured above are some of the varieties, shapes, & colors of loose pearls and strands that we have waiting for you to pick out your custom piece or necklace strand! Gallery show in August....more details to come! Duris Studios is excited to announce that in mid-August we will be having a gallery night focused on pearls and all their gorgeous variations! The artisans are busy creating some wonderful new pieces that we are thrilled to share with you. Things are in the planning stages now, so there will be many more details to come in the next few days. Stay tuned for more exciting news!